I got a second chance on my Squall jacket! 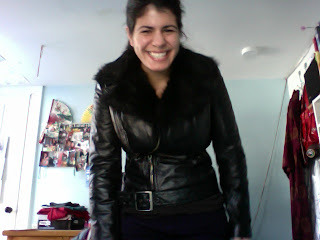 Oh the happiness of a black leather motorcycle jacket with a faux fur collar. It turned up on ebay about a week ago and this time I didn't let it get away from me. But oh, the stress and anxiety of bidding on ebay, if I do it too often, I may develop a heart condition. The seller was super awesome and I had the jacket within three days. And yeah, it's size small, and it might be ever so slightly too tight in the bust area, but I'm going to wear it anyway. How often do you get a second- er- third chance with such an item?